In The Cobblestone next to the movie theater & Uncorked. Get Crafty, Have a Party, Make Memories! You don't have to be a Monet to create a Masterpiece! 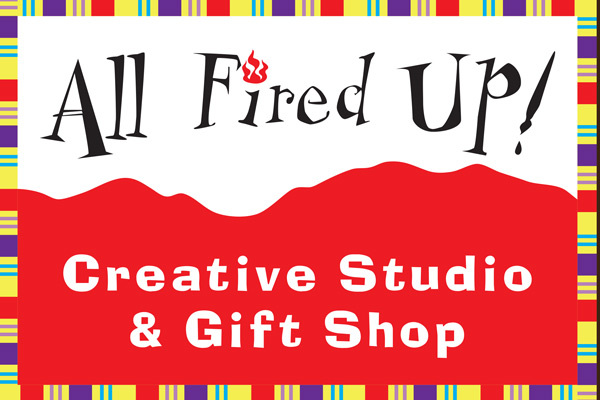 Here at All Fired Up, we offer a array of fun & unique projects and crafts. From pottery painting to chunky candle making, our drop in studio is fantastic for creating heartfelt gifts and everlasting memories. Choose your pottery piece or your canvas size, grab your paints and get crafty! Find inspiration through our stencils, stamps, idea books etc. Build chunky colorful candles, dabble in the ancient art of mosaics and or create your vary own fairy garden! Our friendly and artistic staff is always here to guide you. All Fired Up is not just for the kids! Plan your next friends/family/co-worker night out with us! We're also great for, Bridal/Weddings, Birthdays, Office Parties, Mom's Groups, Team Building, Scout Troops & more! At All Fired Up it's BYOB (Bring Your Own Bottle) anytime! Uncorked Wine Bar is right next door and they will certainly set you up!